It's no secret that I love sweets, especially chocolate. One of my favorite desserts, which is full of chocolate decadence, is chocolate souffle. After devouring this dessert for years at restaurants, I wanted to try my hand at it. 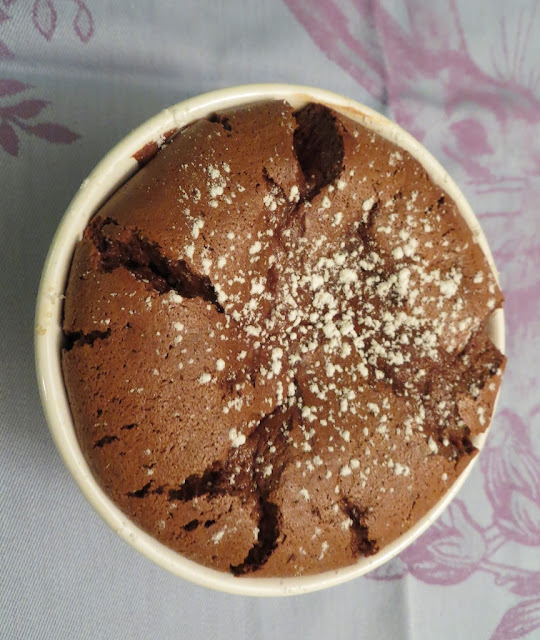 The first time I made a souffle was last year as a Valentine's Day dessert for my husband. At first I was very intimidated by the prospects of making this classic French dessert, however it really wasn't as difficult as I imagined, and the end result was scrumptious! This week I made a home cooked steak dinner and decided to whip up a batch of souffle for dessert. The most difficult part of the process of making any souffle is getting the egg whites right. The one tip I have for this is to make sure that not a single drop of yolk gets into the whites. This happened to me once (it was literally a pin drop of yolk) and the whites would not form "peaks." I actually make this recipe in advance (about 2-3 hours) and store it in the fridge. I think doing this probably decreases the "rise" you get in the souffle, but it does taste the same. Making these in advance is a great idea if you are having a party or guests over so you don't have to bother being in the kitchen trying to fix the souffle after dinner. Simply pop them in the oven, pour yourself some port while you are waiting and you're good to go! The recipe I used is from Martha Stewart found here and it is for individual souffles. Below you will find a couple of pictures of the end result of my most recent souffle endeavor. I usually serve these with powdered sugar and either a dollop of creme fraiche in the center or vanilla ice cream, you might also want to do the more traditional whipped cream. Oh, and don't forget that glass of port! Oh yummy! Thamks for this - and the egg white tip! Thanks Laura! These are very yummy, too yummy!